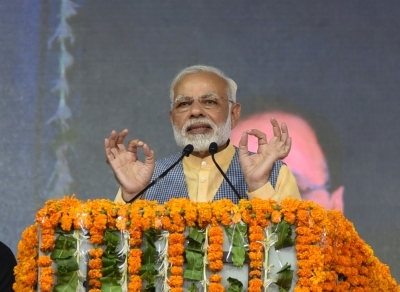 Ahmedabad, Oct 22 (IANS) Prime Minister Narendra Modi on Sunday tacitly warned people in his home state Gujarat about the possible pitfalls of picking a government of a party different from the one at the Centre. Addressing a public meeting after inaugurating a slew of projects, some of them of the level of Vadodara Municipal Corporation, Modi said that as Chief Minister he suffered at the hands of the Congress-led UPA government as it would sit over development proposals because of its “anti-Gujarat, anti-development attitude”. Mimicking former Prime Minister Manmohan Singh in a low soft tone, Modi said that every time he went to him with a request about laying sluice gates at the Narmada dam, he would say: “Abhi tak aapka ka am nahi hua” (Your work still not done). The Prime Minister repeated this twice to sound like Manmohan Singh. Then, Modi went on to cite instances of the Morarji Desai government at the Centre and the Babubhai Jashbhai government in Gujarat as well as that of Atal Bihari Vajpayee in Delhi and Keshubhai Patel in the state and his rule in Gujarat. The Prime Minister said progress had been achieved only when the government in the Centre was sympathetic to the state’s interest and of the same party. “If Atalji’s government was not at Centre, Gujarat would have never emerged from the devastating earthquake (of January 2001). The Centre stood strongly with the Keshubhai Patel government,” he claimed. The Prime Minister also hit out at the Congress stating that the only news during those times was that of large-scale corruption. Listing out his government’s priority programmes as providing electricity to every home by 2019 and house to ever family by 2022, Modi criticized the opposition for lack of vision. “To them, public welfare works are not the priority. They think it is their birthright to rule. They do not have capability to think or have vision,” Modi said. Again, he mimicked the late Rajiv Gandhi without naming him to claim that his own government would not procrastinate before launching development works. “Humey dekhna hain, hum dekhenge, humey sochna hain, hum sochenge… Nothing like this, we implement in decided time-frame,” Modi said, trying to sound like the assassinated former Prime Minister.